My hair is almost all ‘natural’ now, only about half an inch of colour left at the ends of my fringe. Last time I got it cut, I nearly went shorter just to get the dye out, but decided to wait a little longer and keep the style I like. 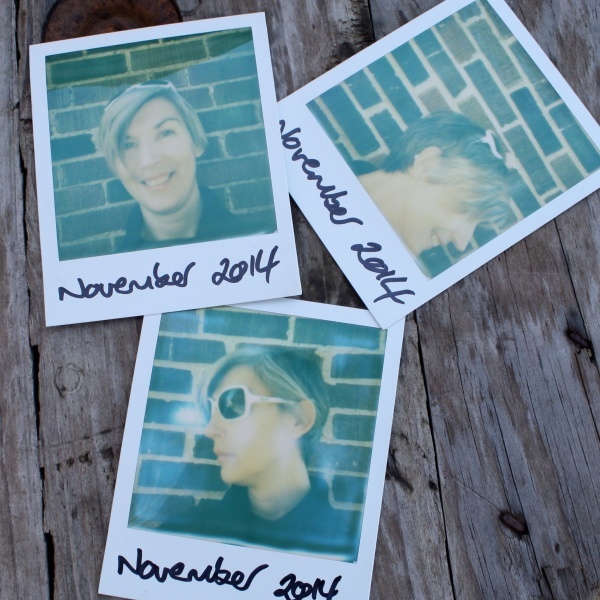 I snapped a few polaroids today to show you where the grey is. It is fascinating to see the grey allocation, the back is pretty much all brown and the front is all Cruella Deville. So how am I feeling about it? Reaching for the dye yet? I am absolutely not going to be dyeing it anytime soon, I would predict that I will never dye it all over again. I am tempted to have a little crazy colour in there though, a spot of blue or purple maybe. It is white for goodness sake, the blank page on my head, waiting for a little colour! I am rather happy with the hefty chunks of grey/white, I quite like them. I am also happy that the grey is not all frizzy and springy, it is still quite well behaved. One of the kids at school asked my why my hair was grey now and when I told her that this was my actual hair colour, she replied ‘No, it’s not.’! I am not doing so well at the make-up wearing, I am just not used to not wearing that much (BB balm with mascara is a fully made up face in my world), that extra layer of foundation and heaven forbid, lip stick is still a work in progress. I have entered the heady world of blusher though! Have you had any hair changes? Long to short? Blonde to Dark? How about a perm? Does anyone still get perms?! well you know i think it looks damn great! do you have any other silver other than at the very front? you know i’ve ditched the dye. i measured my new growth this week. 2 1/2” and 5 months in. this is taking for.EVER. I have just gone super short yikes! and am slowly going to keep dying my hair lighter and lighter… that’s the plan anyhow. It is a bit of a thing isn’t it? The whole grey thing and when you are going to own it. You look great! I hope you are enjoying your short hair! I really like short because I am too lazy to style it! !